Pratunam is a well-known shopaholic’s heaven and you’ll need all your energy to shop, shop, shop! 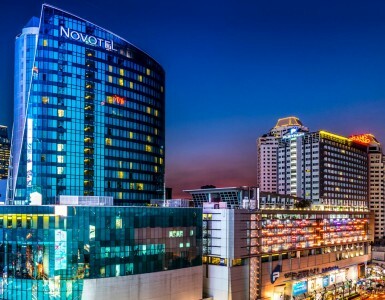 Located on top of famous The Platinum Fashion Mall, you’re right on top of the action when you stay at Novotel Bangkok Platinum Pratunam. Simply take the escalator down from the 6th Floor lobby and you’re immediately connected to a variety of shops with the latest trends in fashion and accessories. What’s more, nearby Pantip Plaza is the place for all of your IT accessory needs. Start your Bangkok exploration in style! Our convenient daily Tuk-tuk shuttle is free for hotel guests and drops you off at key points of interest in the area: Pantip Plaza, BTS Ratchathewi station, Siam Paragon and CentralWorld. Buffet lovers are in luck! At The SQUARE on the 6th Floor, every meal is devoted to presenting a delicious spread of food. Try our renowned Chinese trio of roast duck, BBQ red pork and crispy pork belly in our lunch buffet promotion! Or make dinner a special meal and delight in freshness of our crab buffet. The Best Seafood Buffet in Bangkok or Sunday brunch is another highlight, featuring a delectable selection of seafood on ice and more! Enjoy a great meal and greater savings thanks to different partnerships with credit cards and up to 50% off for Accor Plus and credit cardholders. Relaxing never felt so easy! Whether it’s sunning by the infinity edge pool or enjoying a drink on one of the comfy sofa chairs, you’re in the right spot to unwind and enjoy the panoramic city view. Stay until night falls and enjoy live music, to boot! We know how important a good night’s sleep is. That’s why we’re confident in our soft and inviting beds. Get the rest you deserve after a day out and about! 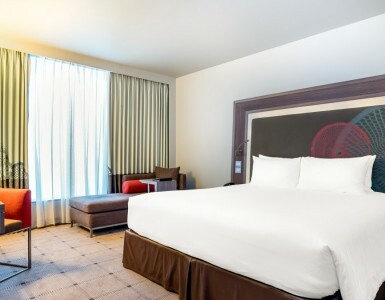 Surf online in style thanks to our in-room high speed WIFI internet and enjoy a bite to eat from the 24-hours room service. With our 5 different room types ranging from Standard to Executive Suite, there is sure to be one that best fits your needs. Now that you’ve heard of the 5 things must do at Novotel Bangkok Platinum, what are you waiting for! Get ready to stay with us and experience a trip full of fun with all the comforts you need.